Sustainable eating has been working its way into the mainstream for decades now, but what does it actually mean to eat sustainably? Wikipedia defines a sustainable diet as “one that promotes food sustainability and ecological well-being.” With that vague of a definition, it’s no surprise that people are implementing sustainability in their lives in very different ways. From vegan/vegetarian to free-range, organic only, and “flexitarian” diets, more and more people are choosing to cut major items or food groups out of their diets in the name of sustainability. While these efforts all have their merits, there’s one common fault that’s slowing down the spread of these lifestyles–they’re all about cutting out yummy foods! And when it comes to lunchtime, old (read: tasty) habits die very, very hard. Amidst the influx of information about what to and not to eat, there is an underwhelming amount of food that seems to be good for both you and the environment. What if adding, instead of eliminating, something delicious to your diet could be an effective way to do right by the environment? Activism is exciting because it brings people together: this time, it’s for meal time and everyone is welcome. Outreach groups, local government, and big businesses in Florida are fusing environmentalism and food in a delicious new way to fight back against a devastating invasive species. If you’ve ever been to an aquarium you’ve certainly seen the infamous cream and red striped frilly swimmer known as the lionfish. In fact, their popularity in aquariums is what led to their recent takeover of Western Atlantic and Caribbean coral reef ecosystems. Depending who you ask, lionfish, native to the Indo-Pacific, were either first introduced when aquarium owners intentionally released the fish they no longer wanted or when an aquarium broke during Hurricane Andrew. Since then, the highly destructive lionfish has become a dominant species in coral reef systems. Like many invasive species, lionfish have been successful because of their ability to outcompete native species. This is largely attributed to three characteristics. 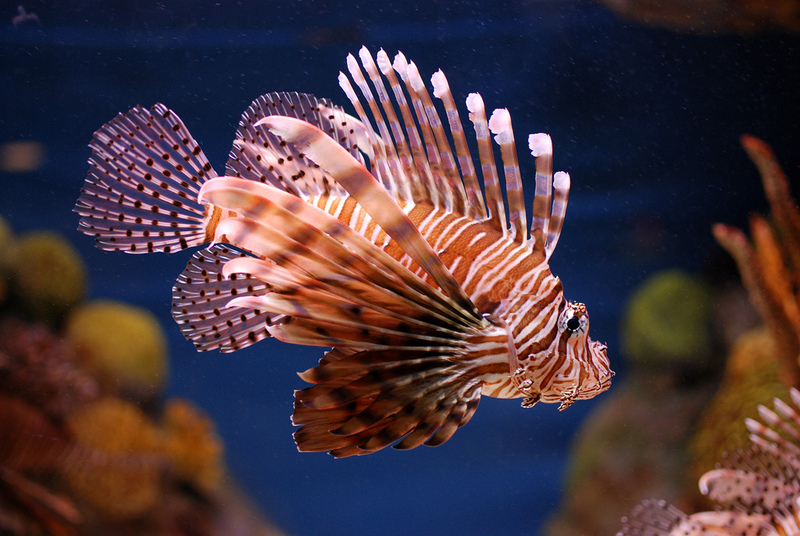 1) Lionfish are voracious, and non-picky eaters. This unsatisfiable appetite wreaks havoc on reef systems. By driving down populations of over forty species of reef fish, lionfish predation allows algal communities, usually kept in check by an abundance of fish, to flourish and effectively suffocate the corals. 2) These guys have no natural predators in their new homes since their venomous spines serve as an insurmountable defense against fish higher up the food chain. This leaves them relatively safe foraging in open water to satisfy their endless appetites. They’re not friends, they’re food! For nearly a decade the consensus (excluding Bruce and the nice sharks) on mitigation plans for lionfish has been simple: eat them. Lionfish cause a tremendous amount of ecosystem damage just by feeding, so hunting alone is an effective management method. But isn’t it more fun if we can eat them? The lionfish problem is a uniquely opportunistic one because, unlike consumption of grouper, halibut, or tuna, consumption of lionfish benefits the economy and the ecosystem simultaneously. While this concept is not brand new, grocery chains like Whole Foods and Publix are now beginning to take on the issue, making meal-ready lionfish available for purchase at stores across Florida. In order to generate a healthy demand, though, people need to want to eat the fish. This is where the fun starts! In addition to corporate involvement in solving the lionfish problem, community groups and local governments are hosting festivals to encourage the consumption of lionfish and spread awareness of the dangers presented by invasive species. Indian River County hosted the inaugural Sebastian Lionfish Festival in 2016, which featured educational presenters, a fishing tournament, and mostly excitingly, a gourmet lionfish cook-off. 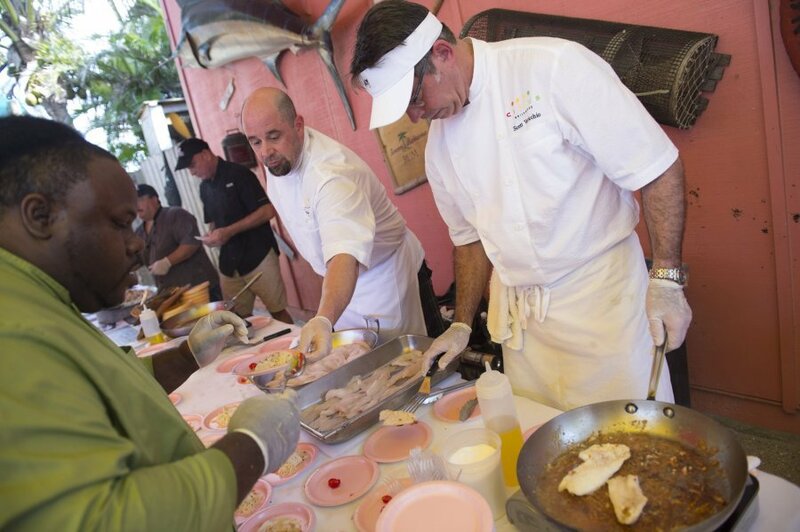 Chefs from popular local restaurants each prepared a different lionfish-centric recipe, including lionfish sliders and lettuce wraps. Participants were then encouraged to try all of the dishes and vote for their favorite. According to Kendra Cope, of the county’s Coastal Division, the festival attracted over 400 community members and won the county’s “Best Environmental Event of the Year” award for 2016. In addition to increasing awareness, the event generated an appetite for this fish: restaurants that featured lionfish afterwards consistently sold out of the dishes in less than one night! The next Sebastian Lionfish Fest will be held in late May and organizers expect twice the turnout for this year’s event. Events like this are being hosted all over Florida and are successfully increasing awareness and participation in local communities! “Just Keep Swimming” Towards Sustainable Lionfish Consumption! Despite considerable success generating demand in local communities, making lionfish affordable remains a significant hurdle. As of right now, the fish can only be collected by divers spearfishing so while whole, bone-in fish go for $9.99/lb at wholefoods, the filets will cost you closer to $30/lb. If you are planning to purchase the whole fish, it is important to consider that handling to remove the venomous spikes can be dangerous. As the public becomes more involved and demand for these fish increases, hopefully we will see a rise in availability of these delicious intruders. From there, the fish’s delicious, buttery flavor will do the rest, helping coral reefs while profiting communities! So if you happen to find yourself face to face with a lionfish fillet in the seafood section of your grocery store, take pride in devouring this exotic invader — I hear it makes for a great ceviche! Kaleigh Davis is a lab manager in the biology department at the University of Central Florida. She graduated from the Odum School of Ecology in 2015 and is a lover of all things aquatic. She is headed to the University of British Columbia in the fall to pursue a PhD in marine ecology. Other life goals of hers include beating Oprah’s marathon time and learning to do a headstand. For now you can find her sipping on coffee at all hours of the day or zigzagging around town watching birds overhead. Get in touch with Kaleigh at kaleighedavis@gmail.com. More from Kaleigh Davis.